A driver has been fined £1000 for causing a cyclist serious injuries after being blinded by the sun. Alistair West, from Glenrothes, admitted in court he did not see the cyclist and only knew there had been a collision when he heard a thud. Cyclist Robert Anderson was struck from the back and sustained multiple injuries including two fractured wrists, a fractured leg and fractures to his spine. The collision took place after he left his work and was on his way to meet colleagues from his cycling club. West (44) of Loch Katrine Gardens, had been charged with dangerous driving but during his jury trial at Dunfermline Sheriff Court he pled guilty to a reduced offence of careless driving. 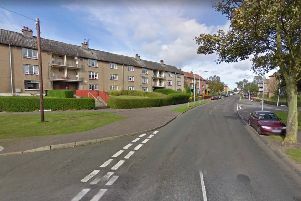 He admitted that on March 9 on the B921 Kinglassie road, he drove without due care and attention, failed to observe a cyclist on the carriageway in front of him and collided with him, knocking him from his bicycle. The accident took place at around 5.40pm and witnesses told the court of the difficult driving conditions caused by the setting sun. Mr Anderson said he had lights on the front and back of his bike and was wearing fluorescent strips when the accident occurred. He recalled other vehicles passing by him but could remember nothing about the collision. Isla Halliday (36) from Kirkcaldy, said she saw the cyclist as she drove on a slip road coming on to the dual carriageway. “I couldn’t see the cyclist for the sun once I was on the dual carriageway but I knew he was there. Mrs Halliday said she moved into the outside lane because she knew the cyclist was in front of her. The van being driven by the accused then passed by her on the inside and struck the cyclist, she told the court. West told the court he was driving his Transit van when the accident happened. “The sun was really low in the sky and it was quite bright,” he went on. Ahead of him a BMW vehicle had “suddenly veered to the right and I thought it was going to hit the central reservation”. It was just after this that the collision with the cyclist occurred. Sheriff Craig McSherry fined West £1000 and imposed six penalty points on his licence.